The NewsLine: Eating chocolate keep you slim? Eating chocolate keep you slim? 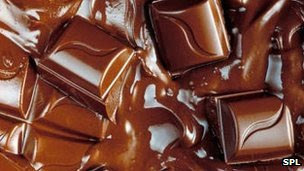 People who eat chocolate regularly tend to be thinner, new research suggests. The findings come from a study of nearly 1,000 US people that looked at diet, calorie intake and body mass index (BMI) - a measure of obesity. It found those who ate chocolate a few times a week were, on average, slimmer than those who ate it occasionally. Even though chocolate is loaded with calories, it contains ingredients that may favour weight loss rather than fat synthesis, scientists believe. And it appears it is how often you eat chocolate that is important, rather than how much of it you eat. The study found no link with quantity consumed. According to the researchers, there is only one chance in a hundred that their findings could be explained by chance alone. Lead author Dr Beatrice Golomb, from the University of California at San Diego, said: "Our findings appear to add to a body of information suggesting that the composition of calories, not just the number of them, matters for determining their ultimate impact on weight." This is not the first time scientists have suggested that chocolate may be healthy for us. Other studies have claimed chocolate may be good for the heart. Consumption of certain types of chocolate has been linked to some favourable changes in blood pressure, insulin sensitivity and cholesterol level. And chocolate, particularly dark chocolate, does contain antioxidants which can help to mop up harmful free radicals - unstable chemicals that can damage our cells. Dr Golomb and her team believe that antioxidant compounds, called catechins, can improve lean muscle mass and reduce weight - at least studies in rodents would suggest this might be so. Mice fed for 15 days with epicatechin (present in dark chocolate) had improved exercise performance and observable changes to their muscle composition. They say clinical trials are now needed in humans to see if this is the case. But before you reach for a chocolate bar, there are still lots of unanswered questions. And in the absence of conclusive evidence, experts advise caution. While there's no harm in allowing yourself a treat like chocolate now and again, eating too much might be harmful because it often contains a lot of sugar and fat too. And if you are looking to change your diet, you are likely to benefit most from eating more fresh fruits and vegetables. "And it appears it is how often you eat chocolate that is important, rather than how much of it you eat. The study found no link with quantity consumed." To say they didn't find a link with quantity consumed implies they controlled for that. They didn't.